Note: Souper Sunday is posting a few hours early today and before the usual deadline for submissions, (see note at bottom of post). If you have a soup for this week, email me with the details and I will add it tonight. When life gets crazy, I am tired, eating too much rich food and I need something simple and fairly quick to restore my energy and feel more balanced, I look to a good miso soup. Throw in some noodles, veggies and sometimes a little tofu, and you have a good hearty but not heavy meal in a bowl. I tried this Soba Noodle Miso Soup from La Dolce Vegan: Vegan Livin' Made Easy by Sarah Kramer earlier this week as I was madly rushing around getting ready for my house guest, wanted to use up some veggies, and didn't want to mess with a more involved dinner. A half recipe makes a large bowl of noodley goodness. Kramer notes: "Miso can be found in Japanese markets and health food stores and comes in a wide variety of flavors, some earthier and nuttier than others. But you really can't go wrong with whatever one you choose; they're all delicious and extremely nutritious--with rich amounts of B vitamins and protein. (Cooking miso will destroy its healthy attributes, so avoid boiling your miso by stirring it into your dish the last few minutes before serving)." In a medium soup pot on high heat, bring water to a boil. Add the seaweed and tamari. Remove from heat and let sit 15 minutes. While soup stock is steeping, bring a medium pot of salted water to a boil and cook the soba noodles. Once done, drain, rinse well, and add to soup stock. Add tofu and bok choy and return to heat for 2-3 minutes. In a small bowl, stir together the miso and 3 tablespoons of the hot soup stock. Stir until miso is smooth. Add miso to the soup, stir well, and serve immediately, garnished with gomashio. In a dry frying pan over medium-high heat, stir/shake the sesame seeds continually for 3-5 minutes, until seeds start to pop and brown. Remove from heat and cool completely. In a food processor, combine dried seeds with salt, kelp and nori and grind for 5-10 seconds (you don't want the seeds to become powder, just lightly ground). Store in an airtight container. Makes approx. 1 cup. Notes/Results: Good and comforting! This is a nicely-flavored soup, a little salty, earthy but with hints of sweetness. I made a few changes based on what I had on hand to use up, like swapping out the tofu for mushrooms from my CSA box. I thought I had a package of soba noodles, put when I found I didn't, some whole wheat spaghetti worked just fine. 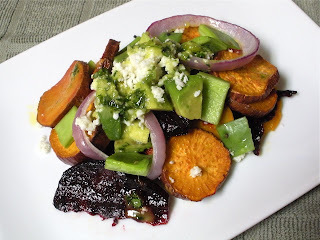 A shredded carrot added a bit of color to the dish. I used a "white" miso for a more delicate flavor, which I tend to prefer over a darker miso. Although gomashio is easy to make, I always have the store-bought kind in the pantry to sprinkle on rice, veggies and such. This soup is a fairly quick and basic lunch or dinner, all in one bowl. First up is Natashya at Living in the Kitchen with Puppies, who whipped up Jamie Oliver's English Onion Soup with Sage and Cheddar for her sick "baby", in her words, "And by my baby, I mean my almost-legally-a-man, Harry, who has been reduced to I-want-my-mommy, my-throat-hurts status." It turns out her baby preferred the cold Popsicles she bought him to the soup, but Natashya and her husband managed to eat this delicious soup for him. 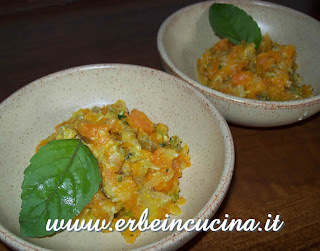 Our resident herb grower and expert, Graiziana from Erbe in Cucina (Cooking with Herbs), is here this week with a colorful Carrot Soup with Basil. Graziana says: "My Holy Basil is ready for the first harvest. I didn't know anything about this kind of basil, and I find out that it's very delicate, and it remembers me lemon or orange aroma. I added it to this summer soup." 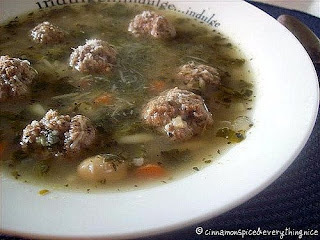 Celebrating the perfect pairing of meat and vegetables is Reeni from Cinnamon & Spice, with her "Minestra Maritata", or Italian Wedding Soup. Extra good with its mini-meatballs, spinach, orzo and her brilliant, hearty addition of cannellini beans. Reeni says, "It was so delicious! The tasty bite-sized meatballs are really hard to stop eating. They are so addicting! This makes a large pot of soup and believe me when I say every bit of it will disappear. Don’t turn your back without getting your fair share!" 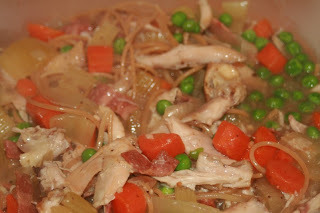 Kait from Pots and Plots is back this week, making the most of some leftover Crock Pot Coq Au Vin, with her Coq Au Vin Noodle Soup. Adding some peas and whole wheat spaghetti to the de-boned, shredded chicken, veggies and broth of the original dish, she came up with this fun, hearty and delicious soup--and you have to love the creative name of this one! 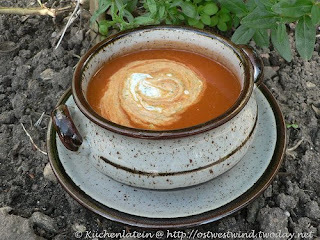 Although not a huge fan of coriander/cilantro, Ulrike at Küchenlatein gamely tried the Tomato and Tamarind Soup from Olive Magazine. She says three stalks and their leaves were enough for her, but that this soup makes "a really speedy and healthy supper." She also mentions that it is low on fat and calories--making it a great light soup for summer. Crystal and Amir from The Duo Dishes are here with a delectable and unusual salad this week, their Nopales and Cotija Salad with Spicy Cilantro Vinaigrette, Nopales are prickly pear cactus leaves, and although they had not cooked with them before, the Duo trolled the grocery aisles for inspiration and with some cotija cheese from their fridge, created this "warm salad with colorful, naturally sweet vegetables, the crunch of the nopales and the bright tang of the cilantro dressing." Thanks to all who shared their fabulous creations this week! If you have a soup, salad or sandwich (or combination) that you would like featured at Souper (Soup, Salad & Sammie) Sunday, click on the Souper Sundays logo on the side of the page for all the details. Note: I have a crazy day today, going to breakfast, taking my house guest to the airport and then rushing up to the North Shore to have a local foods lunch in a tomato field with the local Slow Food group. (Whew!) I am posting all entries that I have received by 8:00 AM this morning and if there are any entries that come in after that today, I will add them to the round-up when I return this evening. 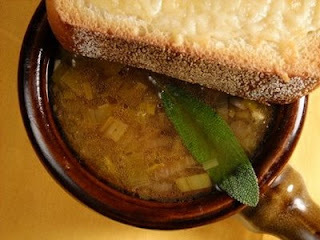 This soup looks extraordinarily good! I love noodles. When you put them in broth I'm in heaven. Sounds like you're in for a fun day!! Enjoy...everything looks great...and thanks for the miso tip, I didn't know that (about losing the benefits during cooking). busy busy! these soups sound so good! Your soup looks great! I can only imagine the variety of flavors in it! Everything looks delicious!! Hope you had a fun week with your guest! Ciao ! You are right what better than a miso soup ? Have a great week! Great collection of recipes, as always. This soup looks so hearty, perfect for replenishing you with strength in time for your houseguest! And a great roundup as usual. Thanks for the miso addendum, I have been on the lookout for it but haven't seen it in supermarkets. Next I'll try the local health food store. I've been looking for a great recipe for miso soup and this looks so good! What a great soup round-up too. My first time on your blog, love it! "Soba Noodle Miso Soup for Souper (Soup, Salad & Sammie Sundays" soooo yuuummmmyyy! Love the soba miso soup! How comforting and yet refreshing!